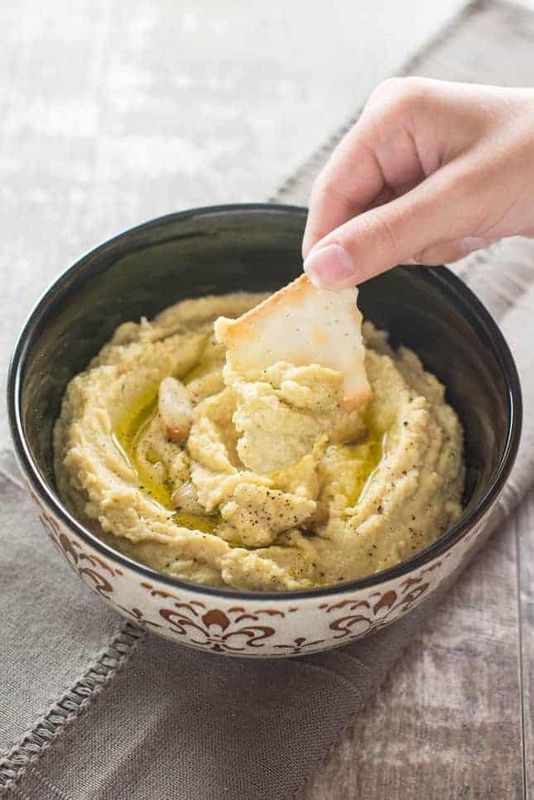 This creamy Roasted Garlic Parmesan Hummus features fresh rosemary, lemon zest and freshly ground black pepper for a delicious, earthy flavor. Hello, is it hummus you’re looking for? Now, hold on there a minute! Before you start judging my level of sanity, in my defense, I’m blaming Adele. Yup, it’s all Adele’s fault. Ever since she came back on the scene with that mega hit of a song, I just can’t seem to get that ‘ole ‘80s tune out of my head! Actually, you should consider yourself one of the lucky ones. Why? Because you don’t have to hear me singing it all day about EVERYTHING. You know, like “Hello, is it Bentley you’re looking for?” FYI, Bentley is our cat. I think those lyrics are really starting to grow on him almost as much as when our five-year-old decorates him with stuffed animals. Anyway, is it hummus you’re looking for? Of course it is. Why else would you be subjecting yourself to silly song lyrics and photographs of a stylish tabby cat? Because YOU love hummus. That’s why! And, so now it’s time to introduce the star of the show…Lionel Richie! JUST KIDDING! 😉 Sorry, but I just couldn’t help myself. 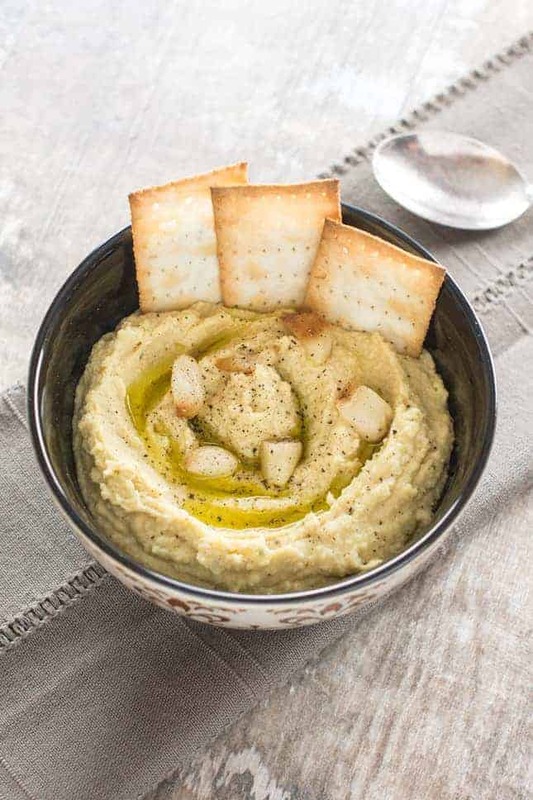 OK, so the real star, of course, is this mouth-watering Roasted Garlic Parmesan Hummus! Get started by preheating your oven to 400° F. then, cut approximately 1/2 inch of the top of a bulb of garlic to expose the cloves inside. Peel away any loose papery layers. Place the garlic bulb on a piece of foil and drizzle olive oil onto the exposed cloves. Season with salt and pepper to taste. Pull up sides of foil and seal up the garlic bulb package. Roast garlic for 35 minutes. Remove from oven and allow garlic to cool for about 10 minutes before handling. 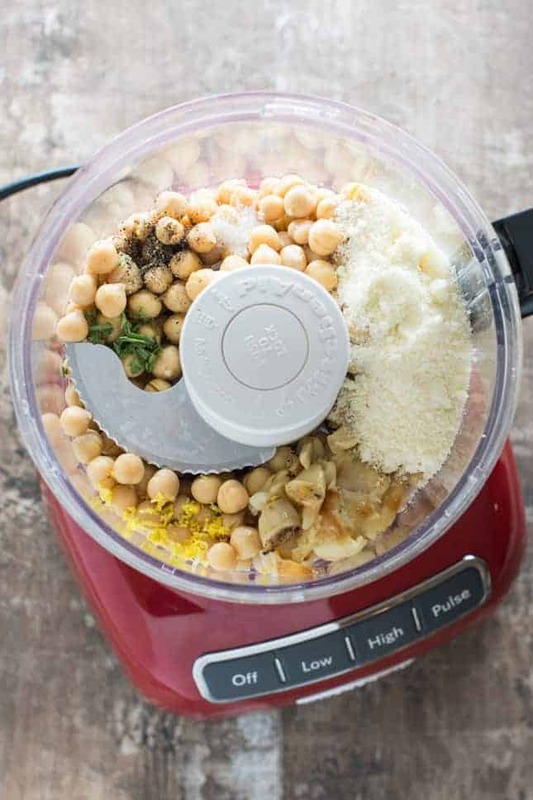 Once the garlic has cooled, add chickpeas, Parmesan cheese, lemon zest, lemon juice, rosemary, salt and freshly ground black pepper to the bowl of a food processor. Carefully squeeze out each garlic clove into the food processor, reserving 3-5 cloves for garnish. Blend on high, slowly adding olive oil until dip reaches a creamy, smooth consistency. Transfer to serving bowl and garnish with reserved garlic cloves, as well as additional freshly ground pepper, if desired. Refrigerate for at least one hour to overnight. 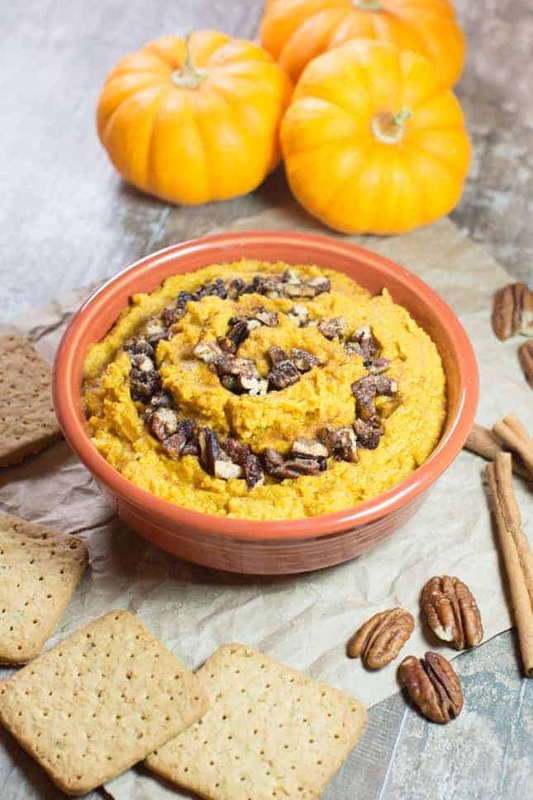 If you love roasted garlic, check out our Roasted Garlic White Bean Dip and our Lentil Pasta with Roasted Garlic, Broccoli and Creamy Red Pepper Sauce. 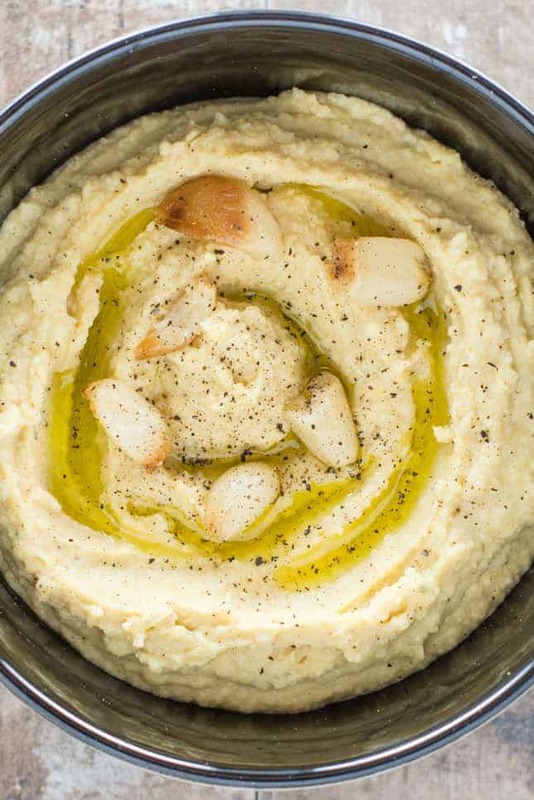 This tahini-free, creamy Roasted Garlic Parmesan Hummus features fresh rosemary, lemon zest and freshly ground black pepper for a delicious, earthy flavor. Cut approximately 1/2 inch of the top of a bulb of garlic to expose the cloves inside and peel away any loose papery layers. Place the garlic bulb on a piece of foil and drizzle 2 teaspoons olive oil onto the exposed cloves. Season with salt and pepper to taste and then pull up sides of foil and seal up the garlic bulb package. Roast garlic for 35 minutes. Remove from oven and allow garlic to cool for about 10 minutes before handling. Add chickpeas, Parmesan cheese, lemon zest, lemon juice, rosemary, 1 teaspoon salt and 1/4 teaspoon pepper to the bowl of a food processor. Carefully squeeze out garlic cloves into the food processor, reserving 3-5 cloves for garnish. 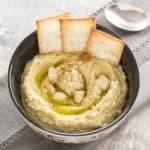 Blend until smooth and creamy on high speed, slowly adding the 4-6 tablespoons of olive oil as you go and occasionally scraping the sides of the bowl of the food processor to ensure ingredients are evenly distributed and hummus is smooth (approximately 3 minutes). Transfer to serving dish and garnish with reserved garlic cloves, chopped if desired. Garnish with additional freshly ground pepper, if desired. Refrigerate for at least one hour to overnight. *Please note that salt and pepper to taste and additional pepper for garnish were not included in the nutrition calculation. Thank you Stephanie! 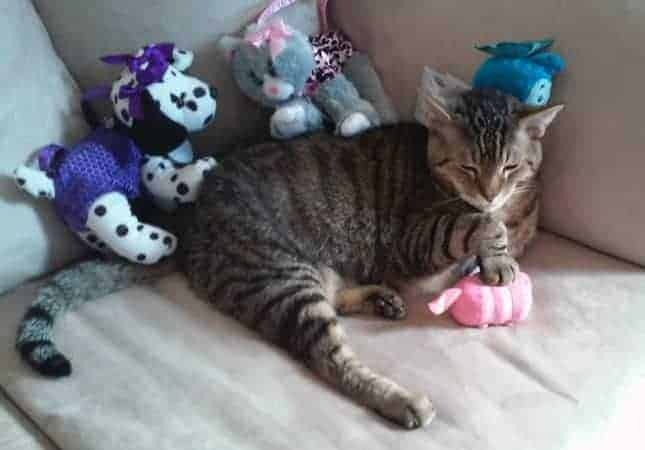 Bentley was such a good cat! 🙂 I hope you enjoy the hummus!